We are so delighted that you've thought to celebrate with us! Public Dining Room is the ideal setting for a Balmoral Beach Wedding. The restaurant offers uninterrupted views across Middle Harbour towards North Head and Manly and encompasses the very best of Sydney’s iconic beach culture. A wedding at Public Dining Room allows for magnificent photo opportunities at the Iconic Balmoral Baths located on our doorstep, while inside every seat is graced with breathtaking beach views. 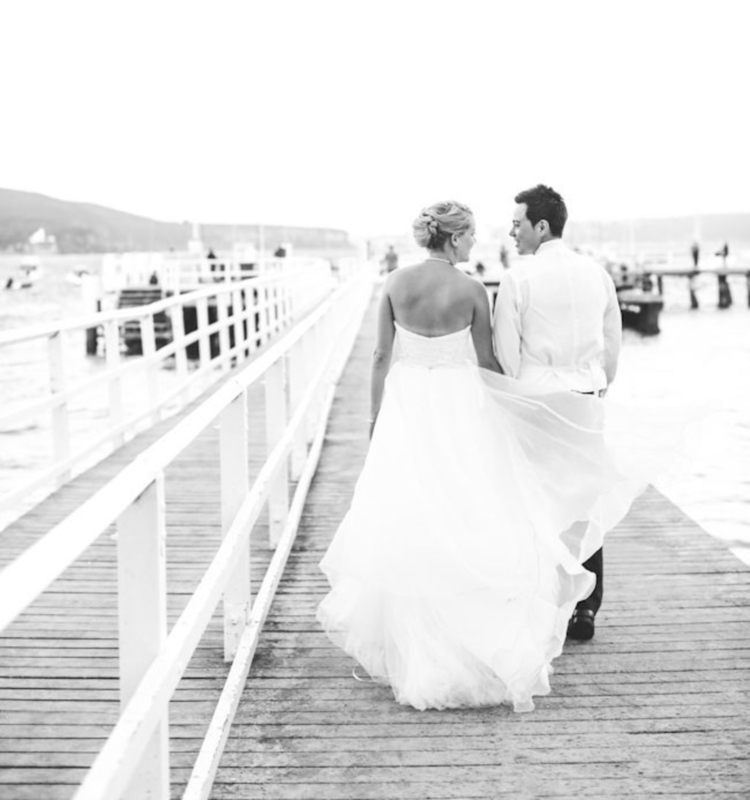 Our adjoining terrace also overlooking Balmoral Beach, is the perfect setting for ceremonies. With unrivalled Balmoral Beach views, Public Dining Room can host anything from an intimate reception in our private dining room to a large whole venue event for up to 110 guests. Let our event team assist in planning the wedding dreams are made of! Public Dining Room has played host to some of Sydney’s most spectacular wedding receptions and we would be honoured to be part of your day too! We just wanted to say another thank you for delivering a perfect wedding venue with amazing food and wine that all our guests continue to rave about. It was the best day of our lives created by you and the restaurant. So thank you again. I wanted to say the biggest of thank yous for your help on our wedding day. Your flexibility and professionalism was outstanding and we cannot thank you enough for your calm and organisation in moving the ceremony venue last minute. Thank you for your help in the lead up to the wedding and adapting the event sheet right up to the last minute. We honestly had the best day of our lives and we have you to thank for that in ensuring everything ran as smoothly as possible. Your staff were also so accommodating and ensured all our guests were looked after and had a wonderful night. The food and wine were outstanding and our guests commented on how lovely the restaurant is. I hope you enjoy the rest of your weekend. I wish you all the best in your future endeavours and will be recommending Public Dining Room to friends getting married in the future. The staff at the Public Dining Room were outstanding in every way. Everyone at the PDR were attentive, extremely organised, polite and professional at all times. The food was spectacular and of high quality. The guests were impressed by the presentation of the restaurant (including the bathroom), the staff, the food and the drinks. There wasn’t a time where a guest had an empty glass for more than a few seconds. Every time my husband and I visited the restaurant before our wedding reception, we were always welcomed so warmly. We were impressed from the beginning of our experience of booking the PDR for our reception until the end of our wedding reception. I was so blown away by the customer service. Many guests of our wedding said that the venue was amazing and they would like to have a function there in the future. Thank you Public Dining Room for making our wedding day just ever so special. My husband and I look forward to many more dining experiences at the Public Dining Room in the future. We had our wedding reception on the terrace at Public Dining Room. I am so happy we chose Public Dining Room for the wedding and wouldn’t hesitate to recommend this to my friends or to hold another event there. I seriously don’t think the reception could have been better. Thank you for our absolutely amazing wedding at your venue. We could not have asked for anything more and everything was so nicely put together. Our guests are still talking weeks later about what a great day it was; the food was fantastic, the views amazing, the service we received was splendid and everything was even better than we could ever have expected. We could not fault a single thing and were in awe for days at how awesome everything was. The gentleman that was looking after us on the days service and manner was fantastic – so accommodating and friendly and we loved having him be part of our day. We cannot wait to come back again for a meal and have been recommending Public Dining Room to all our friends. Thank you so much again for accommodating all our needs, the assistance you have given us and making our wedding such a memorable and brilliant day. Public Dining Room was the perfect venue for my ceremony and reception. My husband and I had photos before the event at Bradleys Head where we then jumped on a water taxi and landed at Balmoral Beach. I then walked down the aisle to marry the love of my life surrounded by friends, family and the most perfect view of the sun setting over Balmoral. We had canapes after the ceremony for our guests while we grabbed some quick family photos under the fig tree right outside Public Dining Room. Then the best part of the night started, celebrating in style. The food was amazing and our guests loved the beer and wine choice. Our recent Wedding day at Public Dining Room couldn’t have been more perfect. We had so many calls and texts the next day raving about the food and wine- for us the most important part! The Sommelier helped us create our own package which went down a treat. Thanks for making our wedding day so special! We want to take this opportunity to say a BIG THANK YOU for organising our wedding. It was beyond our wildest dreams to see PDR be transformed to a picture perfect French whimsical garden and we felt like we were in the South of France. IT was PERFECT. Can you please extend our greatest thanks to all of the waitstaff that served us. We felt like king and queen. Can you please also pass this message onto the sommelier: thank you so much for always checking in with us, ensuring our glasses were full with good wine and taking care of all our guests to ensure they were given their wine of choice. It was so nice and thoughtful. Even having a chat to our guests who LOVE wine! They loved you. Can you please pass this onto management: we definitely felt the love that day and will always cherish PDR for making the day so very special and catering to every wish we wanted. We’re on cloud 9. I would like to thank you and PDR for making our wedding day so memorable and special. Thank you for all the assistance that you have provided to us leading up to and including this day. The service we have received has been nothing short of attentive and organised. Our requests and questions were responded to promptly, and even the last-minute change that we threw at you was accommodated without issue. Thanks to the floor staff who looked after our guests and made the day run so smoothly. Our guests are still telling us how great the food was, and how perfect the venue was. We couldn't agree more with them. Just wanted to say a humungous thank you for all of your help and support through all of the wedding organising! We had the most beautiful day, the food and wine were enjoyed by all and it was just fantastic. The way it was set up was great, and the staff were all so lovely and helpful. Amazing amazing amazing and cannot thank you enough!! !